In previous sessions in the “Digital Methods and Tools Seminar Series” we have talked about collecting textual data from the web, analysing texts using corpus methods and visualising data. 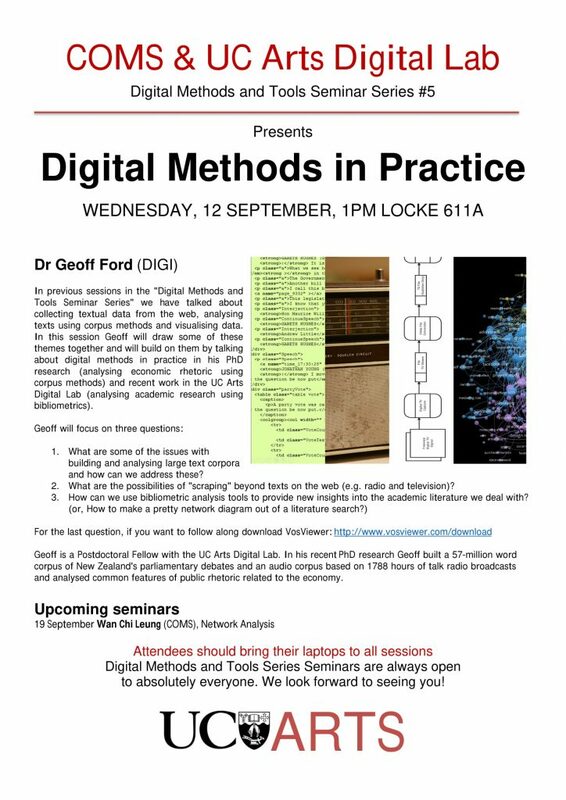 In this session Geoff will draw some of these themes together and will build on them by talking about digital methods in practice in his PhD research (analysing economic rhetoric using corpus methods) and recent work in the UC Arts Digital Lab (analysing academic research using bibliometrics). What are some of the issues with building and analysing large text corpora and how can we address these? What are the possibilities of “scraping” beyond texts on the web (e.g. radio and television)? For the last question, if you want to follow along download VosViewer. Geoff is a Postdoctoral Fellow with the UC Arts Digital Lab. In his recent PhD research Geoff built a 57-million word corpus of New Zealand’s parliamentary debates and an audio corpus based on 1788 hours of talk radio broadcasts and analysed common features of public rhetoric related to the economy. Digital Humanities Meetups welcomes guest speaker Dr Anuj Misra from the Observatoire de Paris. Details of the talk below. Where: Poutama Room 388, Puaka-James Hight Library, UC Canterbury. With increasing collections of historical sources becoming accessible to different scholars from different areas of expertise, the advances in digital humanities provide powerful means to analyse, edit, and relate this growing corpus in more meaningful ways that one may have previously imagined. 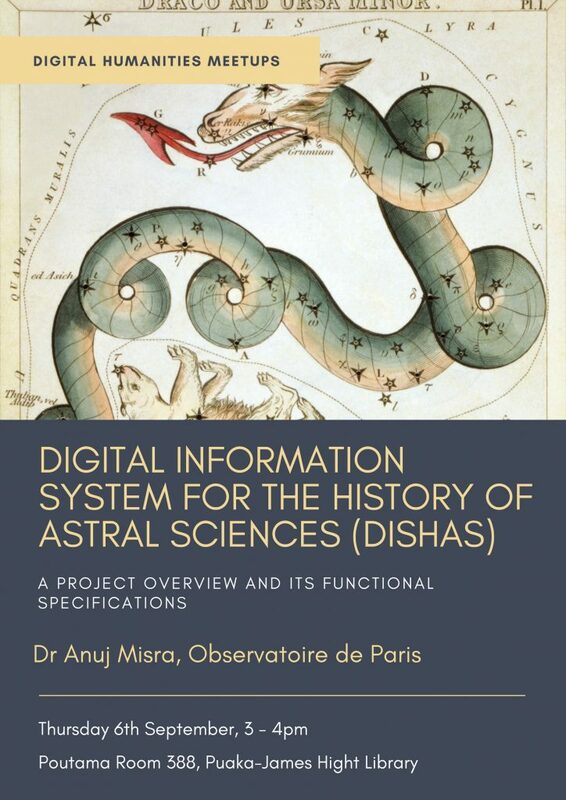 The DISHAS project (Digital Information System for the History of Astral Sciences) is an ERC-funded research project based at the SYRTE Laboratory, Observatoire de Paris in France that works in designing digital solutions to aid in the study of the history of astral sciences. DISHAS relies on a collaborative network of international projects in Chinese, Sanskrit, Arabic, Latin and Hebrew traditions as it develops digital tools to store, edit, and analyse different types of `knowledge-structures’ in the history of astral sciences, namely, scientific instruments, prose and versified texts, iconography and technical/geometrical diagrams, and astronomical tables. This talk introduces the current state of DISHAS as it works with astronomical tables as its preliminary developmental focus. Dr Anuj Misra is a historian of mathematics who works on medieval and early modern sources in Sanskrit mathematical astronomy. His research focuses on structural changes in systems of knowledge, in particular, the Islamic influence in Sanskrit astronomical texts and tables of early modern Mughal India. Dr Misra is adept at reading several classical languages of antiquity and mainly works with primary sources (manuscripts) in his study of cross-cultural transmission of mathematical ideas. He is trained in theoretical physics and philosophy and maintains a keen research interest in areas of computational humanities, mathematical anthropology, cognitive linguistics, and philosophy of mathematics. He is currently a postdoctoral fellow of the Systèmes de Référence Temps Espace (SYRTE) Laboratory at the Observatoire de Paris in France. NVivo can assist with qualitative data analysis. 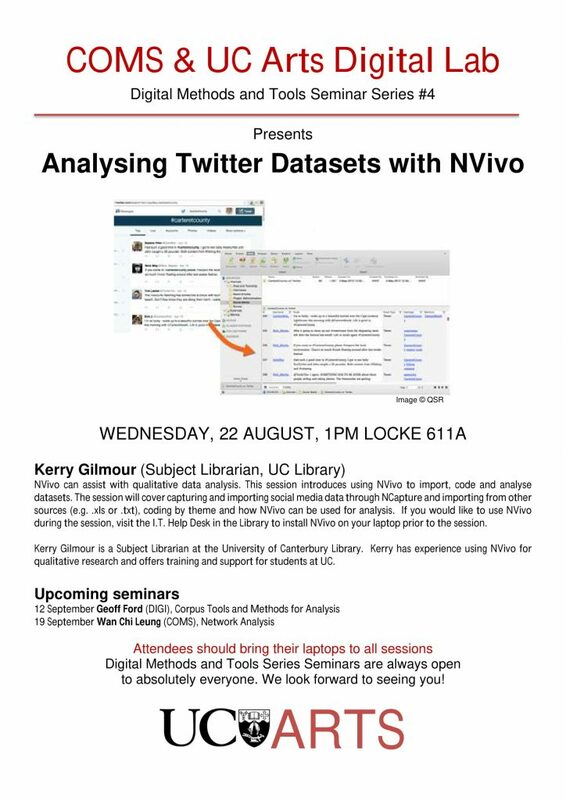 This session introduces using NVivo to import, code and analyse datasets. The session will cover capturing and importing social media data through NCapture and importing from other sources (e.g. .xls or .txt), coding by theme and how NVivo can be used for analysis. If you would like to use NVivo during the session, visit the I.T. Help Desk in the Library to install NVivo on your laptop prior to the session. Kerry Gilmour is a Subject Librarian at the University of Canterbury Library. Kerry has experience using NVivo for qualitative research and offers training and support for students at UC. 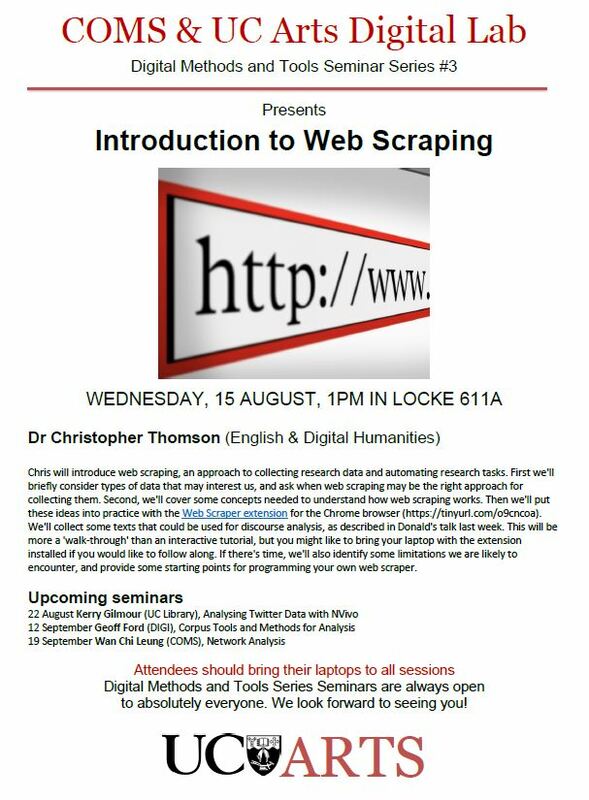 Chris will introduce web scraping, an approach to collecting research data and automating research tasks. First we’ll briefly consider types of data that may interest us, and ask when web scraping may be the right approach for collecting them. Second, we’ll cover some concepts needed to understand how web scraping works. Then we’ll put these ideas into practice with the Web Scraper extension for the Chrome browser (https://tinyurl.com/o9cncoa). We’ll collect some texts that could be used for discourse analysis, as described in Donald’s talk last week. This will be more a ‘walk-through’ than an interactive tutorial, but you might like to bring your laptop with the extension installed if you would like to follow along. If there’s time, we’ll also identify some limitations we are likely to encounter, and provide some starting points for programming your own web scraper.